By Shelby Fierke, M.D., and Tal Laor, M.D. This 11-year-old boy presented with left knee pain and inability to extend his knee following a football injury. Radiographs and subsequent MRI confirm a patellar sleeve fracture. A patellar sleeve fracture is an acute osteochondral injury, usually of the inferior pole. The extent of injury frequently is underestimated. 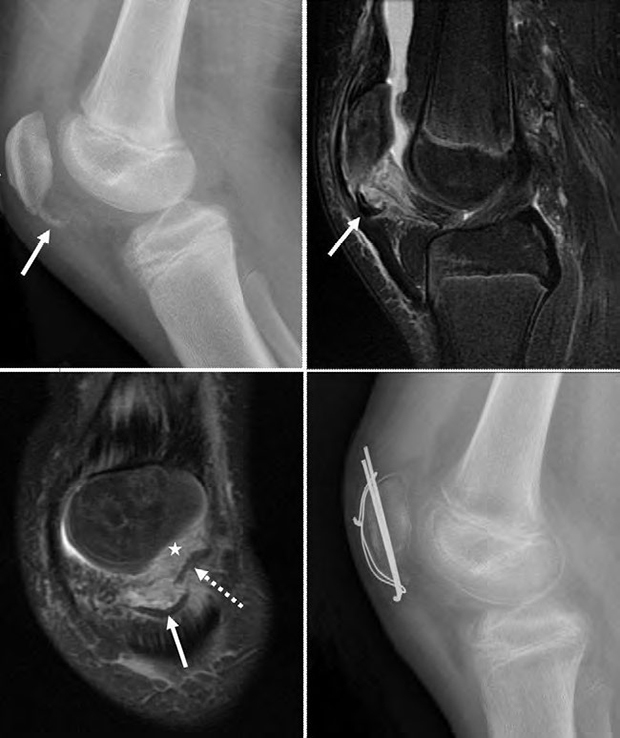 In this boy, there is an avulsed bony fragment (arrows), a separated cartilaginous component (dashed arrow) and a large cartilaginous defect in the patella (star). Patellar sleeve fractures occur usually between 8-12 years of age, and result from a forceful contraction of the quadriceps muscles against resistance. On physical examination, there is lack of active extension and point tenderness over the lower patella. Lateral radiographs can show the bony fragment, soft tissue edema, and a joint effusion. Patella alta or a high-riding patella may be present. Radiographs may underestimate the degree of injury, as the bony fragment can be small or even absent, but the concomitant cartilaginous component can be large. MRI is helpful to depict the extent of cartilaginous injury and displacement, which in turn affects management. Nondisplaced fractures typically are treated conservatively whereas displaced fractures undergo surgical reduction. This child underwent internal fixation, as shown in the final radiograph. Fireke S, Laor T. At the Viewbox: Patellar sleeve fracture. J Am Osteopath Coll Radiol. 2012;1(2):38. Shelby Fierke, M.D., and Tal Laor, M.D. Dr. Fierke and Dr. Laor work with the Department of Radiology, Cincinnati Children’s Hospital Medical Center, Cincinnati, OH.